If you are a new user to TeamSupport, or are an existing user who needs to periodically import new data, you may use the Data Import tool. Simply create a .csv file with the necessary columns, and the import tool will add the data to your account. *Please note: The import tool does not perform updates to existing data. You may only add new new data that cannot conflict with data already in your system. For example, you are not able to add a custom field to a ticket which already exists in the system. The Company Primary Contact table is the only exception. Data in this table must be overwritten and therefore there is no rollback option available for this table. 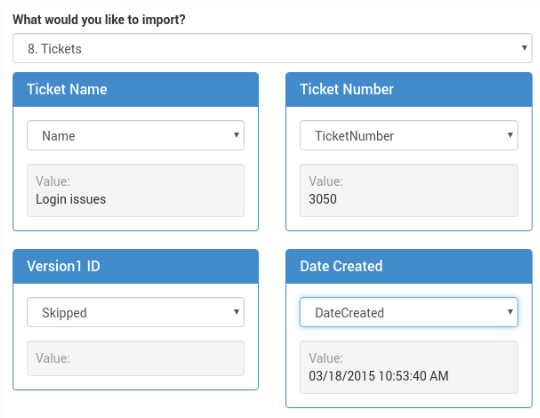 Follow these steps to be sure your existing data is prepared for import into TeamSupport. Review our field definitions: This will give you an idea of the system field that are available, which fields are required, and any custom fields that you will need to create in your TeamSupport account. Create Necessary custom fields – If there is a field in your existing system that you want to import into TeamSupport but there is not a corresponding TeamSupport field name, you will first need to create a custom field within that TeamSupport table to map to your existing field. Otherwise, if you attempt to map your fields and find that the custom field is missing, you will have to cancel your import, create the custom fields, and then begin again with your mapping. Mapping Custom Properties – Make sure that the data that exists within each of your existing field names is also included in the custom properties of the TeamSupport field. 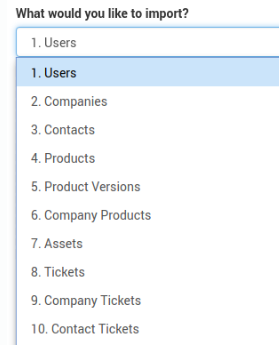 For example: The Ticket Type field in your existing data may include Issue, Support and Bug as pick list options, but if the TeamSupport Ticket Type field only includes Issue and Support, you will need to add the Bug object within that field. Relate tables together using “ImportID” – When relating tables together, an “ImportID” is required for each table. An ImportID can be any number you choose. For example, you can import Customers, Contacts, and phone numbers into your account. First, import Customers using a CustomerImportID. When importing your Contacts, you will make reference to the CustomerImportID so that you can identify which Company the Contact belongs to. You will also set a ContactImportID when importing contacts. To import contact phone numbers, you will make reference to the ContactImportID. Export Existing Data – Export your existing data to a .csv file. If you would like to start with our template, you can click here for a blank spreadsheet containing the required fields for each table. The import tool requires csv files. You can use your own files, or you can make edits to the template, then export each tab as a csv file in order to import. You will notice in the provided template that each column has a unique descriptive name. 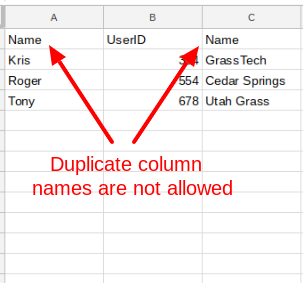 Using descriptive names will make it easier to associate the columns to the correct fields during the import. Additionally, it is important that the header in each column is not used more than once. If you have two columns where the header is “Name”, the import will not be able to parse the data correctly. If you are importing HTML into descriptive text boxes like Actions, you will need to encapsulate the description between quotes. Description, "<p><b>This is a new Customer!</b></p>"
If you have quotes with your html like this <p><b>This is a "Priority" Customer!</b></p>, you will need to encapsulate the internal quotes with additional quotes as well like this "<p><b>This is a ""Priority"" Customer!</b></p>"
!When importing data, if you plan to reference tables together, it is important to progress in a logical order according to how the tables are numbered in the screen shot below. For example, in order to capture the assigned user for Tickets, you must have first imported the Users, then import the Tickets. If you proceed in the reverse order, you would have to rollback the Tickets import, and start again in the correct order. It is important to remember that you must always import in sequential order according to how the tables are ordered in the following down menu if you expect the tables to be referenced properly. Click the “New Import” button. Choose the table from the drop down menu. You have the opportunity to change this at the next step. Drag and Drop your .csv file, or click the “Select a file from your computer” button. Click Next to proceed to defining your fields/columns. The tool will attempt to auto recognize the fields that you have defined in your .csv file. Each column in your .csv file will be shown as a box with the name of your column as the title. Check each box to ensure that the fields are being mapped properly. You can change the selection in the dropdown box, including “Skipped” if you don’t want to import that column. Use the right hand side of the screen to view all available fields, and their definitions. As the import progresses, a log will be generated next to the percentage complete. Click on the log at any time to view the progress. If there were any errors, or if data was skipped, information will appear in the log. You may rollback any import by clicking on the rollback button to the right of the log that was generated for the selected import. !The Company Primary Contact table cannot be rolled back because the import data actually overwrites existing data. All other tables have a rollback option. The screen will auto refresh after a few seconds and the text file should appear with the words “rolledback” in the log name. The option to roll back expires after 30 days. After this time frame the option to roll back and the text file will no longer be available.